Former CoB alumni gathered with current and retired faculty and staff during various alumni events this fall 2014. Some SIU alumni remember cheering on their favorite Saluki teams. Others remember the walks across the bridge that connects the dorms with the beautiful park scenery of the campus. 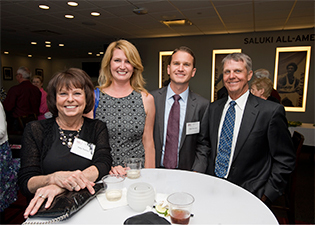 Hundreds of College of Business alumni journeyed back to Saluki land from Chicago, New York or even farther abroad this semester to relive their college glory days. In doing so, they celebrated the eclectic school’s spirit while reconnecting with former classmates, teammates, professors, advisors and their splendid campus during SIU’s annual Family and Homecoming weekends. The kickoff of the alumni activities this semester was the Sept. 27 Family Weekend tailgate. A significant number of students, alumni and family members of all ages – and from all around the world – were in attendance for the event. They joined the College of Business faculty and staff on that beautiful afternoon to share laughter, swap stories and fond memories, and enjoy refreshments before pouring into Saluki stadium. There, they helped cheer on the Salukis to a 34-17 victory over the Fighting Leathernecks of Western Illinois University. More College of Business alums returned to Saluki Row Oct. 24 to mingle with faculty and staff during the “Wild With Pride” Homecoming tailgating events. They got to see an early teaser of the upcoming Saluki basketball season in front of the SIU Arena grand staircase, performances by the Marching Salukis, cheerleaders and dance team Shakers, and the traditional main event: the Homecoming football game. Over burgers, hot dogs and cold beverages, casual conversations flourished while the attendees reminisced about their college days. Earlier in the day, visitors had the chance to enjoy the Homecoming parade through downtown Carbondale, take their children and family members on a private campus tour, and explore unfamiliar sights on campus, such as the new athletic and dining facilities. The night before, more than 65 College of Business alumni had gathered with current and retired faculty and staff, as well as students and friends, at Morris Library. The occasion was a reception that included an appetizer buffet and a mix of drinks, music, memories, jokes and laughter. The event created an opportunity for alumni to reconnect with their former mentors, and to meet new staff and faculty. Jill Gobert, the current director of development and alumni relations at the SIU College of Business and an SIU double alumna, knows the significance of such events. Gobert said she was thrilled by the positive feedback from these fall 2014 events, and she has great news for the SIU College of Business alumni. Because once a Saluki, always a Saluki!